1. At the end of the M4, junction 49, take the second exit sign-posted A48. 4 miles further on, at the Crosshands roundabout, again take the second exit sign-posted A48 Carmarthen. 15. At the Y junction take left fork, sign-posted Fferm-Y-Felin and Skanda Vale. 16. Fferm-y-Felin is the 1st farmhouse on the right hand side, approached by a cattle grid. 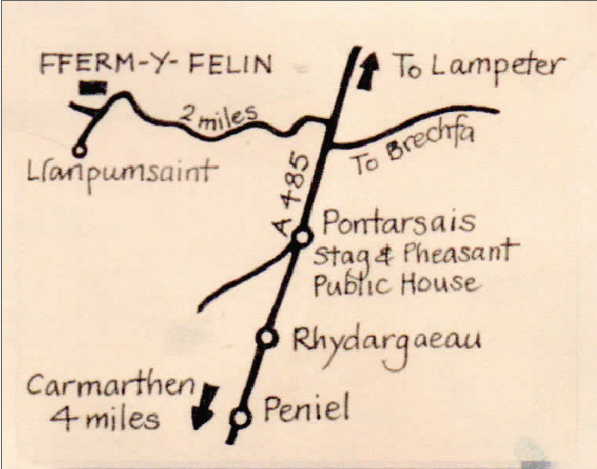 Sat nav instructions: If you are using a sat nav, the post code to enter is SA33 6DA, the sat nav will take you to a property called Bodran Felin which is about 500 yards from Fferm-y-Felin. You will need to have this property on your right hand side, drive to the Y junction, keep left and we are the first property on the right hand side approached by a cattle grid on the Skanda Vale road.